Don't get me wrong it's not a new method. If you partake in cannabis, you've probably overdone it at some point and felt like the walls are closing in. Or instantly forgot what you just said and were suddenly paranoid everyone in the room thinks you're weird? Or put your vape pen down so you can look for your vape pen? If you have puffed your way over that blurry line between pleasantly stoned and low-level anxiety, you'll appreciate the importance of knowing when to stop. 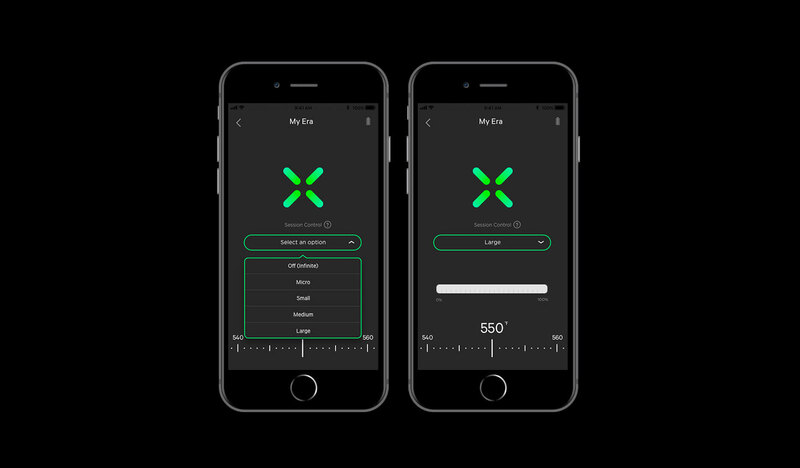 PAX, makers of the Era cannabis concentrate vaporizer, understands and has added a "Session Control" feature to the Era's mobile app for those that want technology to help moderate their usage. PAX users can already control the amount of vapor (and flavor) per draw via temperature settings in the app. Session Control builds on this with four preset dosage amounts (micro, small, medium or large). This isn't just about preventing a "whitey," many medicinal users want to reap the therapeutic benefits of cannabis, without having to consciously control their intake. Finding that sweet spot can be the difference between pain relief, and unwanted inebriation. Once you choose your session "size," the Era will stop vaporizing for 30 seconds after that limit has been reached (no matter how many puffs that takes). The idea being that you start low, and work your way up to an amount that works for you. This will obviously change depending on the strain your using, but the extra layer of control will help the more cautious user find where they like to be. If you decide you want to carry on going past the limit, simply remove the "pod" and reseat it to cancel the session. So be careful if you're a fidgety type that likes to pop the cartridge in and out between inhales. Right now, the feature is limited to the Era vaporizer, which uses proprietary capsules of cannabis concentrate. There are many variables such as temperature, inhale amount and so on, so the feature isn't as easily transferable to the company's other vaporizer, the PAX 3, that can be used with flower. PAX hopes the feature will appeal to newcomers in particular but also expects more seasoned users to appreciate the extra level of control. It might also come in handy for those with greedy friends, allowing you to sneakily limit their consumption. There is, of course, a way to disable the PAX completely, with the app's "lock" feature (also a handy parental control). The Session Control feature will appear in the iOS and Android apps starting today.